Note: Since Eloise Butler's time, the scientific names of plants and the classification of plant families has undergone extensive revision. In brackets within the text, have been added when necessary, the revised scientific name for the references she used in her article. Nomenclature is based on the latest published information from Flora of North America, USDA and the Checklist of the Vascular Flora of Minnesota. Other information in brackets may add clarification to what she is saying. It seems amazing that Mother Nature - by blending two factors, temperature and moisture, in different proportions - can form an endless variety, no two seasons alike, [with] constant variations in vegetation. Spring was late and cold with continual downpours. The early blooms were much belated, but the last heavy frost was later than usual, so that the new foliage had had time to develop a resistant epidermis and did not suffer as in the year before, when May Apple and twisted stalk were blighted and fern fronds seared. The flower buds of dogwoods and viburnums were, however, badly affected, and the food for birds was materially diminished. The unfolding buds of walnuts and hickories were, as usual, frozen, I despair of ever having any nuts develop. The display of spring and summer flowers was fine - hepaticas bloodroot, spring beauty, anemonella, anemones, marsh marigold, mertesnia, trilliums, violets, dentaria, wild geranium, buttercups, showy orchis, habenarias, cypripediums, lilies, etc. Lupine was a great joy. As I have but little sandy soil, I have found it difficult to establish. I think that is is now a permanent possession. So also is horsemint which thrives on a coal cinder diet. This plant is particularly effective in masses, growing as it does, in large clumps, with its flower spikes made up of whorl upon whorl of pale yellow spotted corollas subtended by more showy pink, velvety bracts. Then followed the unprecedented midsummer drought. The wild garden suffers less than other places on account of the lie of the land - drainage flowing into it from three sides. But this season foliage of shrubs on the hillsides shriveled and dropped off. I did not mind the prickly ash dying, of which I have a superfluity. On this shrub during the early wet season there developed a disgusting scale insect enwrapping nearly every twig. The heroic remedy applied was pruning and burning, lest the pest might spread to other plants. I cannot tell until next season how many plants were killed outright by the drought. The most apparent effect was the smaller crop of autumn blooms and the scarcity of mushrooms. In one respect I was surprised. A year ago a drought prevented the annual appearance of the huge edible fan tuft (Polyporus frondosus) at the base of our venerable white oak [Old Monarch]. Sometimes it has attained a weight of over eight pounds. This year it sprang up again and grew to a goodly size. It as taken up while still growing for the delectation of the Mushroom Club. 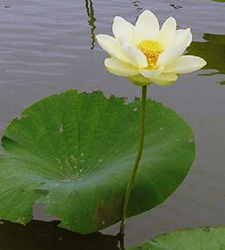 Above: American Lotus, Nelumbo lutea. Photo ©Merle R. black, Wisconsin Flora. Since I left Minneapolis this fall, an interesting discovery was made. A wild duck was given to a pair of ardent nature lovers [Martha and Bill Crone]. In dressing the bird, some undigested seeds of American lotus (Nelumbo lutea) were found in the gizzard. This was enough to start an investigation, for the lotus has been nearly exterminated in the vicinity of Minneapolis. The duck was shot near the neighboring town of Stillwater. [actually Shakopee]. My friends thought that they knew every square rod of the territory. But a vigorous search revealed much to their delight a large tract of lotus that had been concealed in blossoming time by a rank growth of tall grasses. A quantity of seeds were collected and encased in balls of clay to serve as sinkers The ponds around my garden were bombarded with these balls, and a quantity of seeds were sent to me to distribute in Massachusetts. I have sent some to the director of Harvard’s botanic garden, and some will be planted in the cemetery where my sister, Mrs. Cora E. Pease, lies buried. The lotus is said to be the largest flower of this latitude. The appearance is striking when the flower in full bloom. And the large top-shaped receptacle is very singular. It breaks off [and] rolls over and over in the water, shedding the seeds through the perforated disk like a patent seed dropper. The text of this article is one of a number of short essays that Eloise Butler wrote while curator of the Garden that after her death were collected in a series titled Annals of the Wild Life Reserve, but were not published. This essay, however, was sent in letter form to The Gray Memorial Botanical Chapter, (Division D ) of the Agassiz Association for probable publication in the Asa Gray Bulletin. Eloise was a frequent contributor. The Agassiz Association was founded in the late 1800‘s to be an association of local chapters that would combine the like interests of individuals and organizations in the study of Nature. The Wild Botanic Garden in Wirth Park, became the "Native Plant Reserve" and was then renamed the Eloise Butler Wild Flower Garden in 1929.